-Minimum bending diameter ID 580 mm obtainable with medium plate thickness. 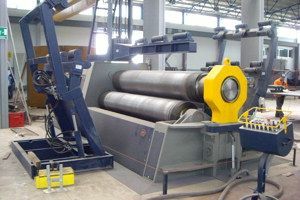 -Hardening of the 3 rolls. High surface resistance 54/58 Hrc. -Conical bending attachment with hydraulic angular tilting of side rolls and hardened sliding insert. -3 rolls driven hydraulic motorized with axial planetary gear unit independent on each roll. -Digital readout on lower rolls positioning. -Parallelism between top and bottom rollers with massive torsion bar on each roll. -The 3 rolls installed on self aligning double crown floating barrel bearings. -Greasing free technology with sealed bearings and self lubricated bushings. -Centralized control panel movable on wheels for easy one-man operation. -3 rolls plate bending machine with pinch pyramid plate pre-bending configuration. -No turning of plate is required all along the rolling process. Easy one-man operation. 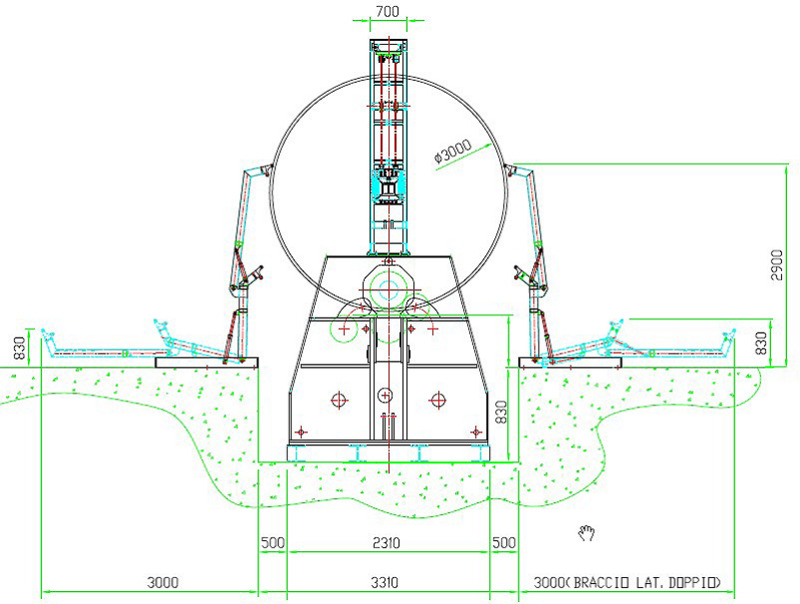 -Machine housing and frames made of welded steel construction. -Parallelism between top and bottom forming rollers guaranteed with massive torsion bar on each roll. 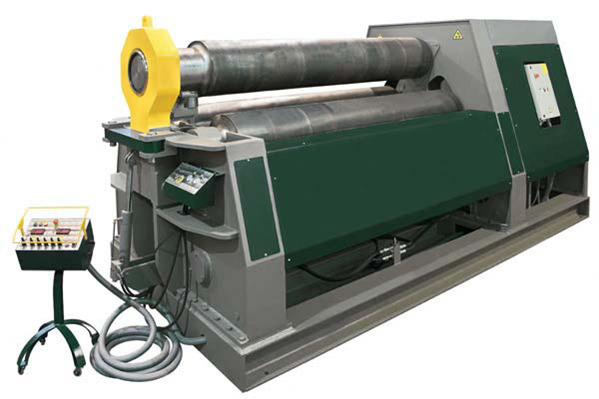 of rolls crowning to achieve best plate pre-bending of leading and trailing edges. 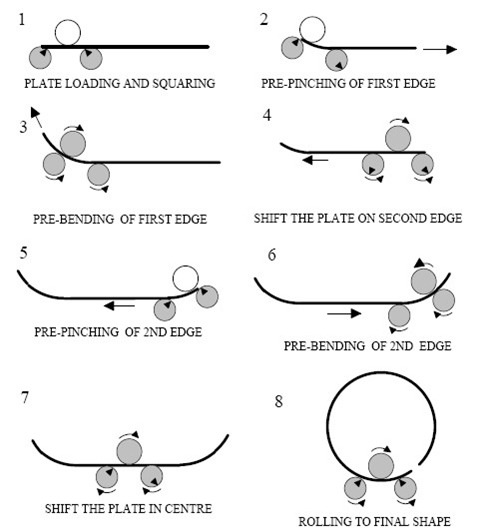 both surfaces of the plate eliminating sliding of the plate while rolling. -Front opening ( drop-end) hydraulic operated to open the front support of the top roll for removal of the formed plate. -The rolls are installed on self aligning double crown floating barrel bearings pre-greased and factory sealed. -Overload protection relief valves on each single hydraulic movable part on the machine. -Hydraulic limit switches ( relief valves) to stop the roller at their end position. -Automatic hydraulic instant braking of rolls rotation. -Emergency shut-down system by means of electric safety push buttons. -Perimeter protection all around the machine with safety wire operating power shut-own. operations through independent pumps to power simultaneously the rolls rotation and the bending movements of forming rolls. -All the movable parts are controlled with direct drive solenoid hydraulic valves operated from remote console. -Single centralized electric motor standard star/delta start, to run the pressure hydraulic pumps. -Complete electric control of the machine from a single centralised console to accommodate the best working position. -Greasing free technology. All parts pre-greased and sealed in the factory. High efficiency components with reduced maintenance. -All the commercial components electric, hydraulic, bearings, pumps, valves, are of first quality European manufacturer. -Input power supply 3 phase Vac to be provided by user up to the machine. -Air compressed supply not required. -Foundation drawings at order time. -1 Sets of operation and maintenance manuals will be provided along with the machine. -Instructions for operating the machine with sequence process description. -Instructions for proper maintenance of the machine, including service charts. -Safety instructions during operation and maintenance of the machine. -Electrical/electronic circuit diagrams and wiring diagrams with parts identifications.